Choosing to spay or neuter your pet is one of the most responsible decisions you can make as a pet owner. Spaying and neutering pets is estimated to add years to your pet's life in decreasing or eliminating their chances of getting certain cancers; it also helps decrease the amount of animals in shelters and the number of euthanized pets each year. We recommend the Humane Society of Tampa Bay for spaying and neutering your pet. With high quality doctors and a nice new building they can keep your cost down. 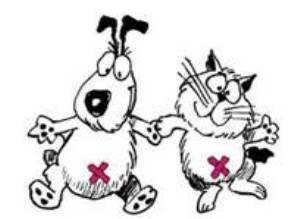 Call them today (813-876-7138) for your pet's spay/neuter appointment. Be sure we have all your pets vaccinations up to date when making your appointment to save you time and money. With statistics indicating that nearly 4 million pets in the United States are put down annually, we believe spaying and neutering animals is a productive initiative.